Prolonged CD4 T cell lymphopenia after administration of polyclonal anti-thymocyte globulins increases the rate of posttransplantation morbidity, but whether impaired immune reconstitution affects survival is unknown. We studied the effect of CD4 T cell lymphopenia on survival in 302 consecutive prevalent renal transplant recipients and the role of thymic function in CD4 T cell reconstitution and posttransplantation outcomes in 100 consecutive incident renal transplant recipients. We followed the prevalent cohort for a mean duration of 92 months. Of these 302 patients, 81 (27%) had persistent CD4 T cell counts <300/mm3 and 36 (12%) died during follow-up. We observed a higher death rate in patients with CD4 T cell lymphopenia persisting for >1 year (24.1 versus 7.6%; P < 0.001). Furthermore, in Cox regression analysis, CD4 T cell lymphopenia associated with a nearly five-fold risk for death (adjusted hazard ratio [HR] 4.63; 95% confidence interval [CI] 1.91 to 10.65; P = 0.001). In the incident cohort, we estimated thymic function by T cell receptor excision circles (TRECs) per 150,000 CD3+ cells, which predicted efficient CD4 T cell reconstitution. Higher pretransplantation TREC values associated with lower risks for cancer (adjusted HR 0.39; 95% CI 0.15 to 0.97; P = 0.046) and infection (HR 0.29; 95% CI 0.11 to 0.78; P = 0.013). In summary, prolonged polyclonal anti-thymocyte globulin–induced CD4 T cell lymphopenia is an independent risk factor for death. Determination of pretransplantation thymic function may identify patients at higher risk for CD4 T cell lymphopenia and posttransplantation morbidity, including cancer and infections. Broad T cell depletion by polyclonal anti-thymocyte globulins (ATG) has been used for many years as a part of immunosuppressive treatment in transplantation. These polyclonal antibodies are a complex mixture of antibodies with multiple specificities directed to both T and non–T cells.1,2 These antibodies produce profound T cell depletion via complement-dependent lysis and Fas/Fas ligand–mediated apoptosis.3,4 Although T cell regeneration generally occurs in the months after ATG administration, Muller et al.5 reported that ATG may induce persistent changes in T cell subsets characterized by a low CD4 T cell count and a CD8 T cell expansion. Our group has reported that impaired T cell reconstitution after ATG in renal transplantation represents a major cause of morbidity. Indeed, renal transplant recipients (RTRs) with persistent CD4 T cell lymphopenia exhibit a higher rate of late opportunistic infections6 and an increased incidence of cancers.7,8 More recently, we reported an increased rate of atherosclerotic events (AEs) in patients with impaired CD4 T cell reconstitution.9 Nevertheless, whether impaired immune reconstitution after ATG influences patient survival remains to be determined. Here, we studied whether prolonged ATG-induced CD4 T cell lymphopenia may affect patient survival. Furthermore, we investigated in an incident cohort whether pretransplantation TREC number may predict prolonged ATG-induced CD4 T cell lymphopenia and posttransplantation outcomes. The patients were followed for a mean duration of 92 ± 7 months. Patient characteristics have been described previously.9 Transplant duration at the entry in the study was 72 ± 56 months.9 Categorical variables are depicted in Table 1 and continuous variables in Table 2. Patient characteristics were not different from those of the main cohort (data not shown). The patients were followed for a mean duration of 74 ± 28 months. Mean CD4+ and CD8+ T cell levels at entry into the study (72 ± 56 months after transplantation) were 511 ± 290 and 553 ± 596/mm3, respectively. Mean CD4/CD8 ratio was 1.00 ± 0.92. Mean CD19+ B cell level was 66 ± 62/mm3. There was a positive correlation between CD4 T cell levels and transplant duration (r = 0.32; P = 0.02). By contrast, CD4 T cell count was inversely related to age (r = −0.35; P = 0.01). Eighty-one (27%) patients had CD4 T cell count <300 mm3. Patients with CD4 T cell lymphopenia differed from those with normal CD4 T cell count for age (53.9 ± 12.6 versus 48.4 ± 13.7 years; P = 0.001); transplant duration (54 ± 44 versus 79 ± 58 months; P = 0.001); fibrinogen (4.02 ± 0.90 versus 3.79 ± 0.90 g/L; P = 0.057), LDL cholesterol (1.33 ± 0.37 versus 1.24 ± 0.37 g/L; P = 0.051), homocysteine (19.6 ± 8.9 versus 17.6 ± 6.1 μmol/L; P = 0.027), and C-reactive protein (CRP; 5.7 ± 4.6 versus 4.3 ± 3.3 mg/L; P = 0.011) levels; CD19+ B cell counts (48 ± 46 versus 73 ± 65/mm3; P = 0.002); and pulse pressure (59.4 ± 15.8 versus 54.7 ± 15.2 mmHg; P = 0.018). CD4 T cell counts as well as the proportion of patients with CD4 T cell lymphopenia were similar in patients who received Thymoglobulin or ATG Fresenius (498 ± 287 versus 542 ± 294/mm3 [P = 0.215] and 28 versus 26.3% [P = 0.875], respectively). In multivariate analysis, only age (P = 0.048), transplant duration (P < 0.0001), CD19+ B cell counts (P = 0.014), and CRP levels (P = 0.039) were associated with CD4 T cell lymphopenia. Lymphocyte reconstitution was prospectively studied in 100 patients. The proportion of patients with CD4 T cell lymphopenia decreased with time after transplantation (41% [n = 100], 36% [n = 96], 31% [n = 90], and 25% [n = 89] at 1, 2, 3, and 4 years after transplantation, respectively). By contrast, the probability to develop CD4 T cell lymphopenia 3 years after transplantation when CD4 T cell count exceeded 300/mm3 1 year after transplantation was only 5%. One year after transplantation, CD8 T cell count was higher in patients with CD4 T cell count ≥300/mm3 (500 ± 169 versus 369 ± 216/mm3; P = 0.02). The ratio CD4/CD8 was also higher in patients with CD4 T cell count ≥300/mm3 (0.99 ± 0.36 versus 0.64 ± 0.45; P = 0.005). We observed a strong inverse correlation between TREC levels and age (r = −0.44; P < 0.001). There was also a correlation between pretransplantation TREC number and 1-year (r = 0.33; P = 0.001) and 2-year (r = 0.31; P = 0.002) posttransplantation CD4 T cell counts. TRECs were split into tertiles (≤633 [T1], 647 to 2713 [T2], and ≥2828 [T3]). Kinetics of CD4 T cell reconstitution was not different in patients in T2 and T3 (Figure 1). As a consequence, these patients were analyzed together. 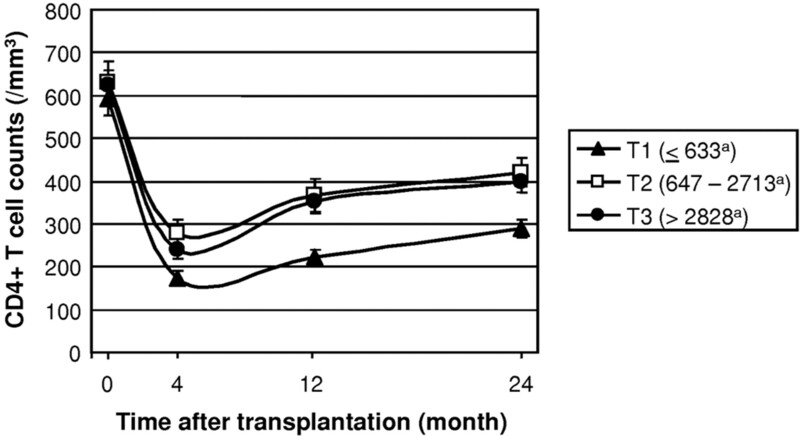 One-year posttransplantation CD4 T cell counts were lower in patients with low pretransplantation TREC values (223 ± 83/mm3 [T1] versus 360 ± 195/mm3 [T2 and T3]; P = 0.008; Figure 1). Similarly, a higher rate of patients in T2 and T3 experienced normal CD4 T cell reconstitution (≥300/mm3) 1 year after transplantation as compared with patients in T1 (54 versus 16%; P = 0.0007). One year after transplantation, CD4+CD45RA+CD45RO−CD62L+ T cell counts were also lower in patients in T1 as compared with those in T2 and T3 (32 ± 23 versus 71 ± 62/mm3; P = 0.040). Kinetics of CD4 T cell reconstitution in RTRs after ATG treatment are shown according to pretransplantation thymic function. In the incidence cohort, the 100 patients were split into tertiles (<633 [T1], 647 to 2713 [T2], and ≥2828 [T3] per 150,000 CD3+ cells), and CD4 T cell reconstitution was analyzed 4, 12, and 24 months after transplantation, respectively, by flow cytometry according to pretransplantation TREC levels. Error bars correspond to SEM. aNumber of TRECs per 150,000 CD3+ cells. One-year CD4 T cell count was higher in younger patients (341 ± 179 /mm3 [<50 years] versus 253 ± 121/mm3 [≥50 years]; P = 0.023). Of note, pretransplantation CD4 T cell count did not predict posttransplantation CD4 T cell counts (P = 0.364). In bivariate analysis (including TREC levels and age), only pretransplantation TREC levels were predictive of CD4 T cell counts at 1 year. More precise, patients with the lower pretransplantation TREC values (T1) had an increased risk for 1-year posttransplantation CD4 T cell lymphopenia (hazard ratio [HR] 3.12; 95% confidence interval [CI] 1.43 to 7.89; P = 0.009). Table 3 depicts sensitivity, specificity, and both positive (PPV) and negative predictive values (NPV) of various TREC thresholds for the later development of CD4 T cell lymphopenia. The area under the Receiver operating characteristic (ROC) curve was 0.77 (Figure 2). 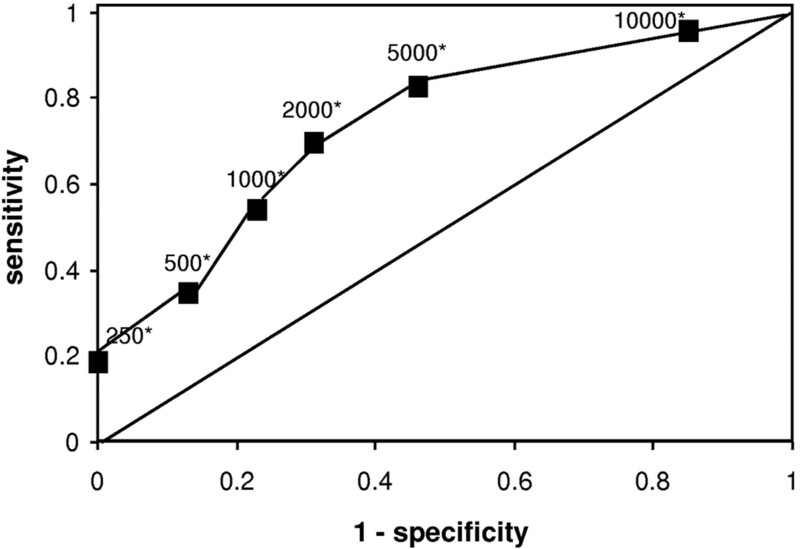 The ROC curve shows association of sensitivity and specificity for various TREC values. The ROC curve was obtained as described in the Concise Methods section. Raw data are shown in Table 3. *TREC values are expressed in TRECs per 150,000 CD3+ cells. A TREC level <2000 per 150,000 CD3+ cells had the best sensitivity and specificity. TREC values ≤250 per 150,000 CD3+ cells were observed in 13 (13%) patients. All of these patients had CD4 T cell lymphopenia 1 and 2 years after transplantation. This corresponds to a PPV of 100%. Thirty-six (11.9%) patients died during the follow-up. This corresponds to 17 deaths per 1000 patients/year. Of them, 13 (36%) died of cancer, 14 (39%) of atherosclerotic disease, seven (19%) of infectious causes, one of pulmonary embolism (3%), and one (3%) of trauma. We observed a higher mortality rate in patients with persistent CD4 T cell lymphopenia (24.1 versus 7.6%; P < 0.001). Survival according to CD4 T cell counts is depicted in Figure 3. RTR survival is demonstrated according to posttransplantation CD4 T cell counts. Survival of RTRs (expressed in percentage of survivors) was analyzed each year after transplantation as described in the Concise Methods section. Two groups of patients were considered: Patients with persistent (>1 year) CD4 T cell lymphopenia (<300/mm3; ●; n = 81) and patients without CD4 T cell lymphopenia (>300/mm3; □; n = 221). *P < 0.05. Forty-four AEs occurred during the follow-up. AEs were more frequent in patients with CD4 T cell lymphopenia (29.1 versus 9.4%; P < 0.001). There was a significantly higher death rate as a result of AEs in patients with CD4 T cell lymphopenia (10.1 versus 3.1%, respectively; P = 0.031). Sixty cancers occurred during the study follow-up. Cancers were more frequent in patients with CD4 T lymphopenia (30.4 versus 16.1%; P = 0.010). There was also a significantly higher death rate as a result of cancer in patients with CD4 T cell lymphopenia (8.8 versus 2.7%, respectively; P = 0.046). Other causes of death (e.g., infections, trauma) were not differently distributed between patients with and without CD4 T cell lymphopenia. In univariate analysis, age (P = 0.003), smoking status (P = 0.04), diabetes (P = 0.017), low creatinine clearance (P = 0.006), high fibrinogen level (0.017), high CRP level (P = 0.001), and low CD4 T cell level (P < 0.001) were predictive of death. After backward stepwise selection, the variables that remained in the Cox proportional hazards model (which were linked to AEs with P < 0.05) were CD4 T cell counts, age, and CRP levels. Gender and duration since transplantation were kept in the model. Cox regression analysis revealed that age in the upper tertile (HR 3.15; 95% CI 1.11 to 15.27; P = 0.047) and CRP levels above the median (HR 5.22; 95% CI 1.63 to 16.70; P = 0.005) were risk factors for death. Patients with CD4 T cell lymphopenia also had an independent increased risk for death (HR 4.63; 95% CI 1.91 to 10.65; P = 0.001). HRs and their 95% CIs of death for each variable in the Cox model are displayed in Table 4, along with P values. Thirteen (16%) patients with CD4 T cell lymphopenia lost their graft during the study period. Seven of them died before the end of follow-up (cancer in two; cardiovascular event [CVE] in three). During the same period, six of the 35 patients who did not have CD4 T cell lymphopenia and returned on dialysis died (17 versus 54%; P = 0.029). Of note, death-censored graft loss was similar in patients with and without CD4 T cell lymphopenia. Twelve (12%) patients died during follow-up. In univariate analysis, higher TREC values were associated with lower death rate (HR 0.32; 95% CI 0.12 to 0.87; P = 0.026). Nevertheless, this association was NS after adjustment for age. Cancer occurred in 20 (20%) patients during follow-up. In univariate analysis, higher TREC values were associated with lower cancer rate (HR 0.29; 95% CI 0.12 to 0.70, for one log [TREC/150,000 CD3+]; P = 0.006). This association persisted even after adjustment for age (HR 0.39; 95% CI 0.16 to 0.97, for one log [TREC/150,000 CD3+]; P = 0.046). Infections occurred in 19 (19%) patients during follow-up. In univariate analysis, higher TREC values were associated with lower infection rate (HR 0.32; 95% CI 0.14 to 0.76, for one log [TREC/150,000 CD3+]; P = 0.010). This association persisted even after adjustment for age (HR 0.29; 95% CI 0.11 to 0.78, for one log [TREC/150,000 CD3+]); P = 0.013). AEs occurred in 10 (10%) patients during follow-up. In univariate analysis, TREC values were not predictive of AEs. Altogether, these data suggest that persistent CD4 T cell lymphopenia is an independent risk factor for death in RTRs and that pretransplantation thymic function (as assessed by TREC levels) may help to identify patients who are at high risk for persistent CD4 T cell lymphopenia and subsequent occurrence of posttransplantation cancer and infections. Our study demonstrated that impaired CD4 T cell reconstitution after ATG administration is a risk factor for death in RTRs. The influence of CD4 T cell lymphopenia on survival persisted even after return to dialysis and immunosuppressive withdrawal. We previously reported that RTRs with persistent CD4 T cell lymphopenia have an increased risk for opportunistic infections,6 cancer,7,8 and atherosclerotic disease.9 Our results here add to the clinical impact of immune reconstitution after ATG administration in RTRs and underlines the need for both pretransplantation recognition of patients who are at risk for impaired immune reconstitution and posttransplantation monitoring of CD4 T cell after ATG administration to guide preventive measures. We also showed that pretransplantation thymic function (as assessed by circulating TREC levels) affects CD4+ T cell reconstitution and both posttransplantation infection and cancer occurrence. An excess of cardiovascular death is the main reason for the increased death rate observed in patients with impaired immune reconstitution. We also confirmed in this long-term study that patients with CD4 T cell lymphopenia have an increased risk for AEs. We previously suggested9 that a lack of anti-inflammatory CD4 T cell recovery (including T regulatory 1, T helper 3, and natural regulatory T cells) after ATG-induced lymphocyte depletion might contribute to the increased incidence of AEs in RTRs presenting CD4 T cell lymphopenia. Indeed, recent studies outlined the role of regulatory CD4 T cells in atherosclerosis.16–19 Patients with CD4 T cell lymphopenia also have higher CRP levels than patients with normal reconstitution. Thus, persistent subclinical infections in patients with CD4 T cell lymphopenia may also generate chronic systemic inflammation leading to accelerated atherosclerosis. We found that both cancer rate and cancer-related death rate were increased in patients with CD4 T cell lymphopenia. This result may be explained by the inability to eliminate or suppress viral infections with a subsequent increase rate of virus-induced tumors. This mechanism could be directly attributed to CD4 T cell lymphopenia. Nevertheless, we also found poor pretransplantation thymic function to be predictive of cancer occurrence, so it could be postulated that a decline to generate a naive polyclonal T cell repertoire and effective immune surveillance may also contribute to cancer occurrence in RTRs with lymphopenia. Similarly, low pretransplantation TREC levels were associated with an increased risk for severe posttransplantation infections. Other studies of adults recovering from lymphopenia have shown that the repertoire diversity of the naive T CD4 cells correlates with both the capacity to respond to vaccines and the resistance to opportunistic infections.20,21 The repertoire diversity of the memory T cell population in such patients directly depends on the extent of thymic function, as measured by thymic size, naive T cell levels, or TREC-expressing T cell levels (i.e., recent thymic emigrant),22 so pretransplantation thymic function seems to influence the risks for both infections and cancers after transplantation. Determination of TREC levels before transplantation could allow physicians to select a high-risk population for specific monitoring and prevention. When progenitor T cells undergo T cell receptor gene rearrangement in the thymus, chromosomal sequences are excised to produce episomal DNA byproducts termed TRECs. Quantification of TRECs in circulating T cells is therefore a useful tool to identify recent thymic emigrants. This permits appreciation of thymic function.23 In addition to analysis in patients with HIV infection, TREC determination was performed in patients after allogeneic hematopoietic cell transplantation. In this setting, pretransplantation TREC levels were found to predict T cell reconstitution both in adults and in pediatric patients.13–15 Here, we showed that pretransplantation TREC number predicts CD4 T cell reconstitution after ATG therapy. Moreover, ROC curve analysis confirmed that pretransplantation TREC is a useful test to predict posttransplantation CD4 T cell lymphopenia (area under the curve = 0.77). Of note, 1 year after transplantation, the number of naive T cells was also reduced in patients with low pretransplantation TREC values; therefore, reconstitution after ATG is at least in part dependent on thymic function. Nevertheless, for a continuous variable used as a predictive factor, defining thresholds is mandatory for clinical practice. Thresholds should have both good PPV and NPV to help physicians in patients' treatment. We found a TREC value <2000 per 150,000 CD3+ cells to be the best threshold for the subsequent development of posttransplantation CD4 T cell lymphopenia. The benefit of ATG is not the same in each patient.24,25 Thus, the choice of a threshold value could vary according to the supposed benefit of ATG. A high benefit of ATG may lead to acceptance of a lower threshold, whereas a weak benefit could lead to preference of higher thresholds. Either way, the possibility to select patients with high risk for immune reconstitution impairment through pretransplantation TREC levels could offer the opportunity to use ATG with more safety. Our study has limitations with respect to patient survival analysis. We included prevalent patients; consequently, a survival bias is possible. Future studies should target a larger cohort of incident patients to confirm our results. Furthermore, we considered only one determination of CD4 T cell levels, and CD4 T cell kinetics could give better information. Nevertheless, we showed in the incident cohort that the risk for exhibiting a complete CD4+ T cell recovery after an initial CD4 T cell lymphopenia is very low. Moreover, even though some patients with CD4 T cell lymphopenia have subsequent lymphocyte recovery, our results suggest at least that the speed of T cell reconstitution is associated with patient survival. Furthermore, because we adjusted all of our analyses on transplant duration, we think that CD4 T cell lymphopenia is associated with survival at any period after transplantation. In conclusion, our study strongly suggests that prolonged CD4 T cell lymphopenia is an independent risk factor for death in RTRs who have received ATG. Because pretransplantation thymic function may predict both immune reconstitution and serious posttransplantation outcomes after ATG administration, TREC number should be determined to estimate the benefit–risk ratio of such a treatment. In many ways, the adaptive immune system of transplant patients with post-ATG CD4 T cell lymphopenia resembles immunosenescence26 (CD8 expansion, reduced B cell number, high levels of acute-phase response proteins, and low TREC levels), and we suggest that ATG could in fact accelerate immune system aging. Because we suggest that thymic involution could independently contribute not only to an increased incidence of infections but also to cancer occurrence, we think that this result could have important consequences for elderly patients and add to the general knowledge of cancer mechanisms in this population. The transplant population with CD4 T cell lymphopenia could serve as a model to study the clinical consequences of immunosenescence. CD4 T Cell Lymphopenia and Death (Prevalent Cohort). We analyzed a prospective cohort of 302 consecutive, stable RTRs (transplant duration >12 months, no acute rejection, serum creatinine <400 μmol/L) from a previously reported study.9 Briefly, all of the RTRs who were routinely evaluated for annual checkup at the transplant unit of the University Hospital of Besançon between June 1999 and December 2000 were consecutively enrolled. All of these patients had received ATG as induction therapy. Induction consisted of a short course of polyclonal ATG with ATG Fresenius (day 0: 9 mg/kg; days 1 through 4: 3 mg/kg per d; 209 [69%] of 302) or Thymoglobulin (Genzyme; day 0: 2 mg/kg; days 1 through 4: 1 mg/kg per d; 93 [31%] of 302). Characteristics of the study population have been previously described in detail (Tables 1 and 2).9 Of note, transplant duration at inclusion in the study was at least 12 months. This prevalent cohort serves first to allow us to study posttransplantation parameters associated at baseline with CD4 T cell lymphopenia and second to allow us to examine the influence of CD4 T cell lymphopenia on patient survival. Determinants of CD4 T Cell Lymphopenia (Incident Cohort). All of the patients who underwent transplantation between March 1999 and November 2004 (n = 177) were considered for inclusion in the second cohort. We excluded patients who had not received ATG and recipients of more than one transplant. A total of 100 consecutive first RTRs who had received ATG (Fresenius in all of the patients) as induction therapy were included. All of these patients received the same maintenance immunosuppressive treatment, including tacrolimus, azathioprine, and steroids. All of the patients except cytomegalovirus (CMV)-seronegative recipients of a CMV-seronegative donor received CMV prophylaxis with valganciclovir in the first 3 months after transplantation. This incident cohort serves first to allow us to study pretransplantation parameters associated with the occurrence of posttransplantation CD4 T cell lymphopenia and second to allow us to examine the influence of these parameters on patient survival. Absolute numbers of circulating B and T cells and CD4+ and CD8+ T cells were determined as described previously.9 Naive CD4 T cells were also assessed as CD45RA+, CD62L+, CD45RO− CD4+ CD3+ cells using the following antibodies: FITC-conjugated CD45RA (clone HI100), phycoerythrin-CD62L (Dreg56; BD Biosciences, Le Pont de Claix, France), ECD-CD45RO (UCHL1), PC7-CD3 (13B8.2), and allophycocyanin-CD3 (UCHT1; Beckman Coulter, Fullerton, CA). All death and causes of death were assessed. Main causes of death (CVE, cancer, and infection) and their relationships with CD4 T cell count were also analyzed. Death was considered to be of cardiovascular origin when from myocardial infarction, stroke, abdominal aneurysm rupture, critical lower limb ischemia, or sudden death in the presence of coronary heart disease. Death that occurred in the immediate suites of coronary revascularization, carotid endarterectomy, lower extremity revascularization via bypass surgery or angioplasty, or abdominal aortic repair were also considered to be of cardiovascular origin. Cancer incidence was prospectively assessed. Death was considered to be from cancer when directly due to neoplastic disease or antineoplastic treatments. Infections were prospectively recorded. Only severe infections (bacterial infections required bacterial infection-related hospitalization, CMV disease [viral replication, symptoms, and treatment by ganciclovir], and opportunistic infections) were considered. Arithmetic mean was calculated and expressed ± SD. Using log-rank tests on Kaplan-Meier nonparametric estimates of the survival distribution, we selected variables with P ≤ 0.20. The selected variables were included in a Cox proportional hazards model, and a backward stepwise selection process was performed, this time at a classical α = 0.05. The time elapsed since kidney transplantation was bound to vary between patients; therefore, this duration was forced into the Cox model as a covariate. Gender and age being potential confounding variables, they were also entered into the Cox model, no matter the significance of their relationships with death. Age was split into tertiles (<44, 44 to 57, and >57 years). Creatinine clearance was split in two classes (<49 and ≥49 ml/min), as were CRP levels (<3 and ≥3 mg/L [median value]) and urinary protein excretion (<0.10 and ≥0.10 g/d). CD4 T cell lymphopenia was considered when CD4 T cell count was <300/mm3 according to our previous work.9 Tobacco consumption was accounted for as currently smoking versus nonsmoking definition variables. We calculated both PPV and NPV of various thresholds of TRECs for the subsequent development of CD4 T cell lymphopenia. ROC curve was performed to determine the relevance of TREC number to predict CD4 T cell lymphopenia. The best threshold was the TREC value corresponding to the higher value of the following equation (Youden index): Sensitivity + specificity − 1. Using log-rank tests on Kaplan-Meier nonparametric estimates of the survival distribution, we selected pretransplantation variables with P ≤ 0.20. The selected variables were included in a Cox proportional hazards model, and a backward stepwise selection process was performed, this time at a classical α = 0.05. Age being a potential confounding variable, it was entered into the Cox model. Age was split into tertiles (<42, 42 through 52, and >52 years). TREC values were not normally distributed. As a consequence, TRECs, expressed as TREC per 150/000 CD3+ cells, were split into tertiles (≤633 [T1], 647 s2to 2713 [T2], and ≥2828 [T3]). When used as a continuous variable, TRECs were log-transformed. Results are expressed as HR and 95% CI, with a P value testing the null hypothesis HR = 1; therefore, at P < 0.05, HR is significantly different from 1, either >1 (i.e., risk for death is increased) or <1 (i.e., risk for death is decreased). Assumptions of Cox models (log-linearity, proportionality of risk in time) were met in this analysis. This study was supported by grants from the Fondation de France (Appel d'offre “Maladies cardiovasculaires” 2007, to P.S. ), the DHOS/INSERM/INCa (Appel d'offre Recherche Translationnelle 2008, to D.D. and P.S. ), the PHRC 2005 (to D.D. ), and the Fondation Transplantation (Appel d'offre 2006, to B.V.). D.D. and P.S. designed the study concept and drafted the manuscript; D.D., C.C., J.B., B.V., A.C., J.M.R., and J.M.C. participated in patient follow-up; C.C., J.B., B.V., A.C., and M.D. contributed to acquisition of biological data; M.D. and C.F. developed the PCR-based TREC analysis; D.D. did statistical analysis; P.T. reviewed the manuscript; P.S. supervised biological analyses, and all authors saw and approved the final version of the manuscript.